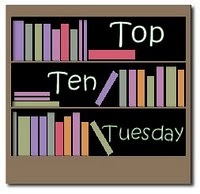 This is the perfect Top Ten topic for me as I read about a book on a blog, want it so badly, go out and buy it, then it sits because I have so many other books I want to read! IQ: How Psychology Hijacked Intelligence by Stephen Murdoch--Ok, I didn't buy this one, it's by my brother. I am SO embarrassed that I haven't read it yet! I am not going to put this back on the shelf. I am going to keep it on my desk so that I read it in the near future! I put a hold on Queen of the Underground by Gail Godwin because her novel Evensong is one of my favorites, ever. I hadn't heard of this one, and I see also that Godwin has an even newer one out now. Good luck in getting all these read soon! I haven't read any of those either! But that's exciting about your brother publishing a book. You have to read it! I would like to read Columbine as well. At least I haven't bought it yet and I waited for the paperback. Michelle--I do feel better knowing I am not alone in my missing out on these books, thanks! Short Story--The guilt I've got about not reading my brother's book yet is huge! Aths--I never get public library books because i am afraid I'd check them out then never read them! I haven't read any of those either--except the one I wrote. Haha. I hope you find time to read Columbine when you have space in your life. I'll be curious to hear what you think. And same for you, LBC. Dave--I really have heard good things about your book and have it on my list for the beginning of summer. Working as a high school teacher librarian makes it all the more interesting, especially since we had a 6-hour lock down last year (threat of a student with a gun). It all turned out (mostly) okay so we were lucky.